A Guide to AwesomeStories primary sources, to content rights in general and correct citation formats. A "primary source" is the best place to get first-hand information. A person who experiences an event, and gives an account of it, is a source of primary information. Maps, photographs, drawings, videotapes, diaries, letters, manuscripts and other similar items can be primary sources. It is our policy to link to primary source material whenever possible. That is the reason most of our links are to worldwide national archives, museums, universities, military and government sites as well as other institutions like historical societies and libraries. It is our aim to provide a virtual trip to reliable places where primary sources are maintained. We frequently link to scholarly sources as well. All links serve as footnotes to our stories. Where helpful, we link to scholarly narratives that explain the subject, or issue, in more detail. Scholarly-narrative links - when we use them - usually appear near the end of our stories, when the reader is more prepared to explore them. Each recommended link, embedded in the story, takes you directly to the source of the footnoted information. If you would like to visit the main page of the linked site, or to further explore its content, eliminate everything in the URL after the ".edu, .gov, .org," etc., and then press "enter." That will take you to the main site where you can then search for whatever additional information you may need. We have thoroughly researched appropriate links, but we can not be responsible for content on third-party sites. Wherever possible, people who really know the subject matter have reviewed the stories for accuracy. Our main objective is to help our visitors find their way to some of the best on-line information regarding the profiled subjects - and to have fun at the same time. We hope you have enjoyed your visit. AwesomeStories is an original content educational tool, which is used by teachers, students and life-long learners. It relies on primary sources, of various types, to enrich the stories. In addition to its own original content - which includes all stories and all descriptions - AwesomeStories externally links to primary and secondary source materials. It also internally hosts those same types of sources. 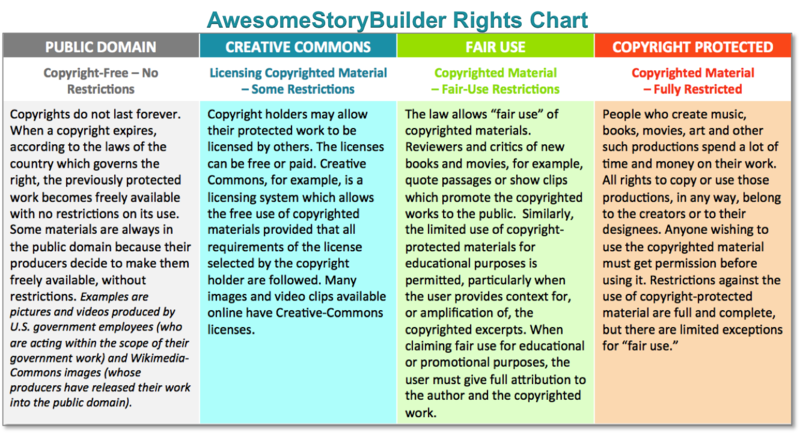 Hereafter is an explanation of AwesomeStories' hosted sources, which fall into three categories: Public Domain, Creative Commons and Fair Use (of copyrighted material). An asset (image, video, writing of any sort, painting, etc.) is in the "public domain" when it is copyright-free. Such assets can be free of copyright due to passage of time, because the work was never subject to copyright protection or because the creator has removed all restrictions which might otherwise apply. For example: Any work created by U.S. government employees, acting within the scope of their employment, is not subject to copyright. The created work belongs to the American people and is "in the public domain" from the moment it is created and released. Such items would include photos taken by U.S. military personnel while performing their duties or NASA astronauts while flying their missions. An object of art, such as a photograph, can be released into the public domain by anyone who wishes their work to be freely available and usable by everyone. For example: A private person's photograph of an exceptionally beautiful sunset can be released by the photographer without restrictions on its use. The photo is thus "copyright free" and in the "public domain." Copyright restrictions do not last forever. The passage of time, set forth by the laws of countries worldwide, applies when a previously copyrighted work is no longer protected by copyright restrictions. Once the copyright expires, the work is in the public domain and may be used by anyone, anywhere, for any reason, without restriction. With the advent of the Internet - and "open source" objectives - "CC" (Creative Commons) and "GFDL" (GNU Free Documentation) licenses are available. Creative Commons, in its various licensing applications, covers the use of a creator's works, which COULD be copyrighted but instead are governed by CC licenses. Those licenses vary from freely available (with no restrictions at all) to limited-rights availability (with some limited rights still held by the creator, such as "use without fees but provide attribution"). For example: If photographers taking pictures of exquisitely beautiful sunsets are willing for their work to be freely used but want recognition as the creator, by users, they will release their photos with a governing license - such as CC BY-SA 3.0 - attached to their work. Translated into layman's words, others have the right to use those photos, without paying a usage or licensing fee, provided that those users specifically follow the type of CC license, which accompanies the released work. There are various types off CC (Creative Commons) licenses. Creators decide which of those licenses apply when they release their work onto the Internet. Beyond using the licensed object, users may also modify and distribute the original work (if the specific license allows for modification and distribution). When the creator releases the work with a CC license, the CC license is clearly noted and governs current and future use of the work. In short, a Creative-Commons work can be similar to a public-domain work except that in exchange for free use the user must follow the requirements set-forth in the creator-selected CC license. Copyrighted works may be used in a limited way, without paying a licensing fee to the copyright holder, under fair use guidelines. This is particularly true if the work is used for educational purposes. Fair use requires that the user must add value to the copyrighted work by providing such things as context, amplifying its meaning or following other guidelines as set forth by governing law. The U.S. Copyright Office provides additional information about "fair use." For example: When authors and publishers release new books, those works are reviewed in publications like the New York Times. Critics and reviewers quote passages from the new works without paying copyright fees. Benefits from those reviews accrue to the copyright holder / author / publisher since the new work is receiving wider attention (without the need for paying marketing costs). In like manner, AwesomeStories uses short clips to draw wider attention to previously released video documentaries and films. Team members at AwesomeStories support those clips by placing them in context and enriching them with short stories or background information, making them far more valuable and meaningful to viewers. AwesomeStories thus freely provides marketing services to creators of its hand-selected video clips, exposing chosen documentaries and films to wider audiences of schools, educators, students and life-long learners by means-of fair-use for education purposes. By far, assets which are hosted by AwesomeStories (and reside in its extensive database) are from the public domain. The site also uses Creative Commons-licensed assets. In those cases, the Creative Commons licenses appear in the "credits" section of each hosted asset. AwesomeStories hosts a limited amount of fair Use assets. In those cases, the fair use designation appears in the credits section of each hosted asset. Bos, Carole D. "Amistad Incident" AwesomeStories.com. Date of access <http://awesomestories.com/famous-trials/amistad>. IN OTHER WORDS: Author. Title of story. Name of web site. Date of access . Bos, Carole "21st Century Research and Content Rights" AwesomeStories.com. Feb 03, 2015. Apr 24, 2019.